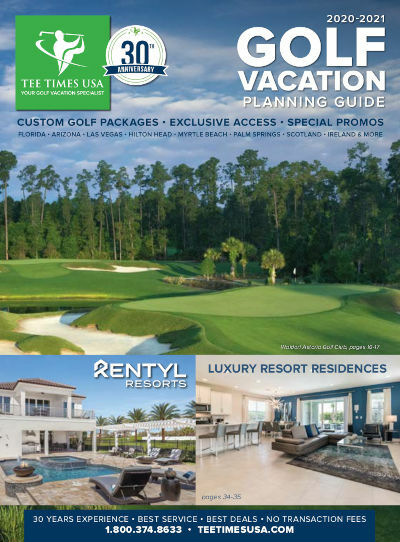 Enjoy the sunshine on amazing golf courses and world-renown beaches, not to mention the Daytona Beach - Palm Coast area's coastal attractions, lodging with views of the Atlantic Ocean - everything for your golf vacation! Below is our list of Daytona Beach - Palm Coast golf package specials. All Cocoa Beach golf packages can be customized to meet your needs. All of the Daytona Beach - Palm Coast, Florida golf courses are offering very attractive rates this year. Below is our list of our Daytona Beach - Palm Coast, Florida golf package specials. All packages can be customized to meet your needs. Virtually every course in the Daytona Beach - Palm Coast area is having one sale or another, we've truly never seen discount prices like this before. In addition to these great golf deals, don't miss Tee Time's exclusive golf group discounts for you and your golf buddies. If you have questions feel free to call us direct and speak with a friendly Florida Golf Vacation Specialist at 1-800-374-8633 or request a custom golf quote - quick and convenient! GREAT course!!! Was in fantastic condition. Very nice course that's protected from the wind. Very fair and fun to play. Course and greens were in great shape. Staff is excellent and very friendly and clubhouse is very nice. This is our 2nd time playing it and enjoyed it as much as the first time. Highly recommend it. As expected, beautifully manicured course. We played the Hills course - and pleased we did as it looked more varied (trees!) and tighter than the Jones which looked more open with generous fairways. Staff all very helpful. Tight course with some longer carries over swamp/water on a few holes. Very good condition, and terrific greens. We had played the Jones course last year and loved it, and loved the Hills this year. Very nice condition. Would love to come back. Played both courses at LPGA. Hill Course is in perfect condition from tee to green. A championship layout that can play difficult of your game is slightly off. Jones Course nice. Greens not up to normal standards, but rumor is they are going to be replaced this summer. Loved the course, great shape. Our group played the Jones course and everyone liked it. The course was in excellent shape. Played both courses, booked by tee times USA, Jones course had a great open layout, was well looked after, greens were good, and easy to play for all levels of golfer. Ladies tees were far enough forward to suit all levels of golfers, gents had a good choice as well. Hills course on day two was a greater challenge than the Jones layout. Much tighter Course, still well laid out, well tended, nice greens. More of a golfers course, maybe not so suited to higher handicap golfers, but a great challenge. Some very interesting tight tee shots, more a course you have to plan your way round, not for the wayward hitter off the tee. Both courses on the two days presented different challenges, which made for two great days of golf, booked by tee times USA. Good condition courses. The Hills course is the better, more interesting track with lots of trees. Jones is slightly easier and more open. We played the Hills course (my favorite of the 2) and found that the conditions were excellent. I forgot how much I enjoy playing at the LPGA International. It was a first for the others in my group and they love it and want to come back again. I highly recommend you play there, the staff is outstanding! We played the Jones course and found that the conditions were excellent.Especially just a few weeks after Hurricane Matthew. I forgot how much I enjoy playing at the LPGA International.It was a first for the others in my group and they loved it and want to come back again. I highly recommend you play there, the staff is outstanding! Played both courses. Both were great.Good condition with very nice greens.Friendly staff. Would definitely play again. An excellent course that tests every aspect of your game. Greens are fun. Water is in play on a couple of holes. Almost all the holes are secluded, so you can only see homes on one or two holes. We've been there twice and would not hesitate to return. We played the Hills course. Difficult, yes...but very fair with fast and true greens. Very scenic. Just a fun day on a great course. Play it...you won't regret it, and with the 'tee times USA' green's fee price...a bargain. Fabulous course with superb conditions. Worth the drive from the Orlando area. Our group loved it! The Hills course is outstanding and a must playcourse when you are anywhere nearby. Some wonderful holes and thecourse is always in excellent condition. No matter how you playyou will enjoy the course and its challenges - truly excellent. Tighter than I remember. Very tough - but nice golf course. A must play course. More challenging than most courses we play - but still enjoyable. Always in great shape and the staff is one of the best. One of our favorites [Jones Course] every time we come down to play. The price is right - course is in great shape - and it is fun to play. Very fair course - if you play well - you can score. Hills Course - trickier than the Jones Course - but a very nice track. Can be penal if you are not hitting the ball straight. But well maintained and beautiful. We played the Champions course. The course was ingeat shape considering hte weather. Highly recommend this golfcourse. Good layout in good shape. Enjoyed the course. Great facility and both courses very challenging.This is our third time playing here and will continue making thetrip from Orlando to play. Perfect fairways. Nice course. We will come back. Good course in great shape. Beautiful course - very challenging but fair. Staff was great - Nice upscale course will definately play there again when we return. Only course we played in 4 days at Daytona that had GPS in cart. Played Legends course - it was in great condition withfast greens. Always a pleasure to play here well kept manicured andfantastic greens a must to play. The staff at the course could not have been any nicer. They went out of their way to make our trip pleasent. The cousrse was in very nice shape and a pleasure to play. I liked both of the courses. They were in excellent shape and well maintained. We almost had the course to ourselves - and the staff was very friendly. Tree lined and mature. Good test and very enjoyable. In decent condition. Very good value. Final course of our week, our crew really enjoyed Halifax. An older course, but we enjoyed that flavor. Very fair play, greens a bit slower than some others we had played, but still very playable. Fairways and tees very well kept. Very nice course. Great shape and condition. This course was on our way home from Daytona and was a great way to end our golf vacation. The food in the club house was very good and the staff was excellent. Play was a little slow... but the course was nice. Halifax was in great shape and the staff was very friendly and helpful. Nice course in a beautiful part of the state. Greens were in good shape as was the entire course. the staff was exceptional. Excellent value and certainly a course you shouldplay more than once as the greens are very tricky to read and youneed to put your ball in the right spot to avoid Augusta likeputts. An enjoyable course making for a good day out. Friendlystaff. Always a quality choice. does not look tough - but is. Loved the drive up from Daytona Beach. Course was busy but spaced out well. Not much waiting at all. Will definitely go back on another visit. Well maintained course. Good facilities. Friendly andhelpful staff. Definitely worth a visit when you are in the NorthDaytona Beach area. A great course and great people. I plan to play hereagain this summer when I will be in the Palm Coast area and Iwill call Tee Times for the arrangements. Lunch was great and the course was in great shape. Everyone enjoyed the round. Very nice semi-private golf course - in good condition. A friendly and accomodating staff. The course was in very good shape and the staff asusual was very accomodating.